Had the best time at Corran House. Was over to do a cetacean surveyors course at the Scottish Sealife Centre just outside town. Arrived really late - after midnight - but it was no problem. Was checked in and joined in the ceili at Marky Dan's downstairs (10% off food for bnb guests). Beautiful view of the loch and highlands from my bedroom window. Bed really comfy and everywhere clean as a new pin! Facilities perfect and large modern kitchen equipped with a fridge full of breakfast goodies. Loved it! Very cool vintage home. Suoer comfy beds, great shower! Other clients were helpful in the kitchen. 5* all the way! What a great stay! The place is safe, very clean and super comfortable. Kitchen is the beat equipped I’ve seen while travelling, and the bathrooms are very good quality. Be careful to request a room not above the pub: we should have stayed in it, but the receptionist kindly moved us, as there was space. Otherwise it would have been noisy. Warm and beautiful building. Good views. Welcoming atmosphere. Very lovely with sea right beside. No lockers, bed with springs, but overall really great! Corran House is a friendly, clean, no-frills guest house. There's a great big kitchen for anyone to cook in and use, as well as ample fridge space. The location is great, right on the water, and there's a lot of parking nearby. 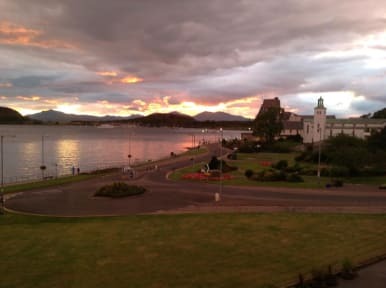 Comfortable beds and a good base to explore Oban and surrounding areas. Visited during winter so not a vibrant atmosphere but perhaps to be expected. Sports bar downstairs that gives discount to guests on food (though the best pub we found in Oban was The Oban Inn). A pre-made pack of what to do and see in Oban (more insight than what you can get from TripAdvisor) wouldn't go amiss. Also lockers for storing valuables would have been good! This is a neat little place with lots of space in the rooms and kitchen. Unfortunately I didn't have the best experience with the staff. As well, there seemed to be only one washroom per floor, so that could get a bit frustrating. It was also quite loud with bat being below. We were on the third floor and could still hear it.